These pugs are having a blast doing ring around the rosy! I had thought of this song earlier but was reluctant to draw it at first since there's not really that many movements to this - it's just dancing around in a circle and then sitting down. But the more I thought about it the more I thought it would be fun to have frolicking pugs dancing around in a circle and then plopping down to sleep. Also it's so perfect for pugs! Sunny is capable of great energy and action but not for extended periods of time. And any additional energy she exerts gets compensated with even more napping time later in the day. 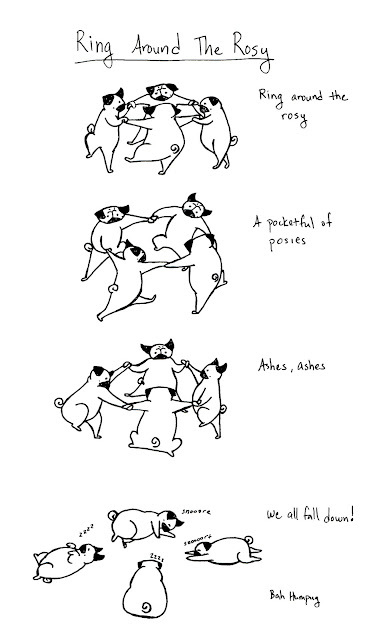 So here are some happy pugs having a blast dancing around in a circle, followed by a good ol pug nap at the end.